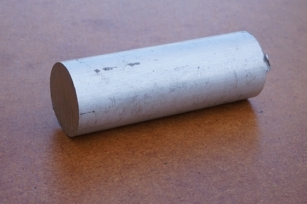 A piece of aluminium alloy bar, 7⁄8″ diameter by 2½″ long, is provided in the kit for making the pistons. Westbury suggests that if a high speed is not required, iron pistons may be a better bet. I will use the aluminium even though I am quite tempted by the advantages of iron. The drawings assume cast pistons and I will do some milling to emulate the cast shape. The most difficult thing would be to reproduce the circular bosses for the gudgeon pins. I am not going to try. I do not understand why there is a 1⁄32″ clearance each side of the little end. By reducing the distance between the boss faces from 7⁄16″ to 13⁄32″, the bearing area in the piston is increased by a round 15%. The pistons will otherwise be to the published drawing. The ring grooves are not specified, and will be made to fit the rings, after I have gapped them and lapped the faces. I intend to make the gudgeon pins before boring the pistons, to get the right fit in the con-rods, then to make the pistons to suit. I want the pins considerably tighter in the pistons than in the little-end bush. 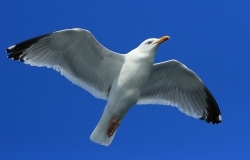 Advice on the choice of material is conflicting; in the construction article Westbury calls for case hardened mild steel, Malcolm Stride suggests silver steel, unhardened, while Len Mason suggests silver steel "hardened right out". I think the latter would be taking too much of a risk for my liking, as they would be very brittle. The kit contains a piece of 3⁄16″ silver steel, but I think that will prove too sloppy in the reamed holes. Suspecting slight burrs on the rings, I gently rubbed the faces with light finger pressure on 800 grit paper, just removing some of the black surface layer. I also carefully rubbed them inside and out, and in the gap. The rings now fit more easily into the sleeve, with measured gaps of 7, 7, 6, & 3 thou. I filed the smallest gap to 0.006″ for consistency. These gaps are really too big for the finished rings, so I need to make a slightly smaller closing sleeve, to reduce the circumference by 3 thou for a 3 thou gap. At 0.7533″ the stub mandrel is just the right size, but unfortunately it will have to come out of the chuck to make a new sleeve. First I re-machined the mandrel guide diameter to 0.7522″, making the seating a bit longer and faced back the outer shoulder, which does not really do anything anyway, to suit doing one ring at a time. Next I made another closing sleeve. At 0.7532″ bore, it was a bigger than I really wanted, but it will be OK. The rings still go very tight in it when clamped, a behaviour I don't really understand. 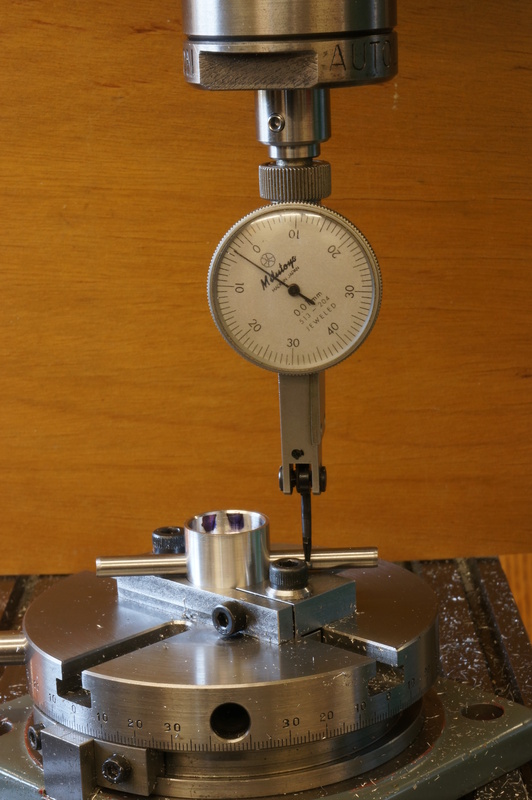 I set the mandrel up again, running true to 0.0002″ TIR. With the smallest-gapped ring I have to tighten the clamp plate fully after sliding the closing sleeve off. I set the topside (by eye on the degree scale) to 5.7° for 1:10 radial movement. I turned the first ring to 0.7497″, which I expected to be ideal. Irritatingly, however, when tried in No 1 cylinder, it shows a gap of 0.006″. In No 2 it is a little tighter, a 0.006 thou feeler will just go in the gap. This gap is bigger than intended but no disaster. The next one just cleaned up all round to 0.7510″. This gives a gap less than 0.002″, so it will need the gap easing a shade. Rings 3 & 4 were both turned to 0.7505″, and both accepted a 0.002″ feeler, No 3 quite tightly. After taking a tiny burr off ring No 2, its gap measured 2 thou in No 1 cylinder. The rings are not dead flat on the faces. Using the cylinder bore gauge inside the ring closing sleeve, I had a means of holding the rings and applying even pressure. I rubbed one side of each ring flat on 800 grit paper on a surface plate. The least thickness I then measured was a little over 0.028″, so 28 thou is the target thickness. Using the first closing sleeve, I faced the back and, with a fresh sharp pointed tool cut a recess to hold a ring for lapping the second side to a set thickness. No 1 ring came out at 28–28½ thou thick, being thickest at the tips. With No 2 ring I started rubbing the side I had already done, but fortunately realised with enough metal to spare. This finished the same as No 1. Slightly worried about wear on the face of the holder, I carried on with No 3 ring, which indeed ended up a shade thinner at 0.0278–0.0283″. No 4 ring was again 0.0280–0.0285″ but this one was not thickest at the tips. As it comes, the silver steel (US: drill rod) supplied in the kit for the gudgeon pins measures 0.1878″, ideal for polishing to nominal size. However, it is a bit too slack in my little ends and I will have to turn the pins. Trying pieces of mild steel as a gauge, I found 0.1882″ to be the target size. Having a piece of mild steel the right size, I decided to try case-hardening it. Unfortunately Kasenit is no-longer available, and this was the first time I tried a substitute. The result was a pin that was as much as half a thou undersize after polishing, and a most unpleasant taint in the air of the workshop. The surface of the pin was file hard in places, but clearly just coating with the powder and heating for a couple of minutes is not going to be good enough. And next time I will do the job in the open air. Turning a piece of silver steel, without tailstock support, I found it was springing out of the way a little, giving a taper, but also a good finish, which is often tricky on this stuff. With this I was at least able to confirm 0.1882″ as a fit, and 0.1881″ a running fit in the little ends. This morning I turned two end pads. I eased the spigots with 1200 grit paper to 0.0941″, which resulted in a light press in the larger ends of the gudgeon pins. With one pad in place in each pin I measured the lengths to determine how much to remove on finishing. I also decided, by fit in the little ends, which pin was which, but there was not much difference. After facing the parting pips off the pads, I pushed them in half way and pressed them home. With the first, it may have thrown a small burr on the brass pad which did not seem to press quite fully home, so for the other one I eased the edge of the hole in the pin with a scraper. Knowing which end of the pin was which, and using the measurements made yesterday, I spherical turned the first pads to length, then measured again to find out how much to take off each second pad. With one of them, I was only able to get sufficient friction to drive the very lightest cuts, though the pad still seemed a good fit and does not want to come out. I ended up with overall lengths of 0.741″ & 0.739″ leaving the pads about 0.005″ clear of the bore an each end. I had made an allowance for the tricky internal undercut resulting in the depth not being quite right, which if left might result in the crown thickness being wrong. I faced the skirt, actually a thou too far, to an internal depth of 0.718″ and corrected the depth of the lower portion of the skirt. The exterior now showed a slight run-out, no more than a thou. 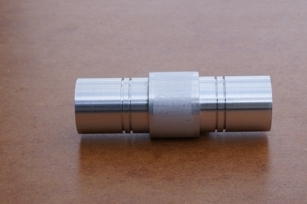 I finish turned the the OD, at about 600 rpm, to 0.7490″ at the bottom, and 0.7491″ at the top, just where I wanted it. For the ring grooves, I used an 8mm square parting tool holder with the blade ground to a width a little less than the groove. The first cut, on the lower groove, seemed to be producing a slight taper, so I reground the tool with a tiny amount of side relief. It made a better job of the top groove, but I am not very happy with them. Quite a bit of deburring was needed to get the piston to go in the bore, and the sides of the grooves are not brilliant. I started by making a block of HE30 for experimental gudgeon pin holes. Then I had a think about how to set the pistons up for making the holes, and decided they needed to be parted, as gripping by the chucking pieces did not seem the right method. 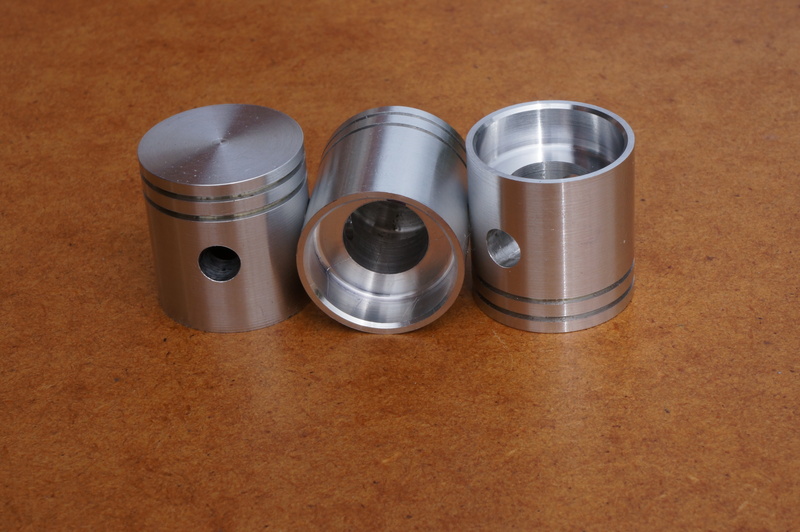 I parted the pistons off and rough faced them, leaving about 0.010″ to finish to length. I then measured each one and faced them to length, or more precisely, they turned out about a 0.001″ short in each case. While using the top face as a datum for the gudgeon pin bore would ensure all the piston crowns would be in exactly the same position a top dead, they did not seem to be precisely square. 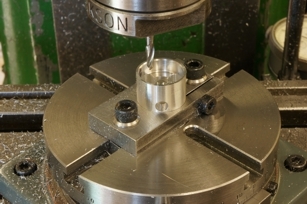 The bottom of the skirt, being machined at the same setting as the OD, would be more likely to be accurately square, and getting the gudgeon pin hole square is more important than a sub-thousandth variation in height. The one thou average shortness can be accounted for in setting up. This morning I bored the jig for the piston and drilled & tapped the hole for the clamp bolt. 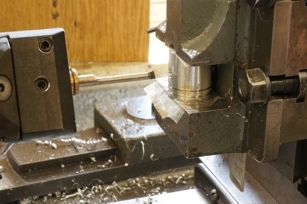 After lunch I set up for boring the pistons, on the vertical slide and vice in the lathe, as I know the fixed jaw of the vice will be square to the spindle. I worked on a trial hole. I have three 3⁄16″ hand reamers to choose from, and I want to find out how to get the best fit, and at this size a tenth of a thou makes a difference. 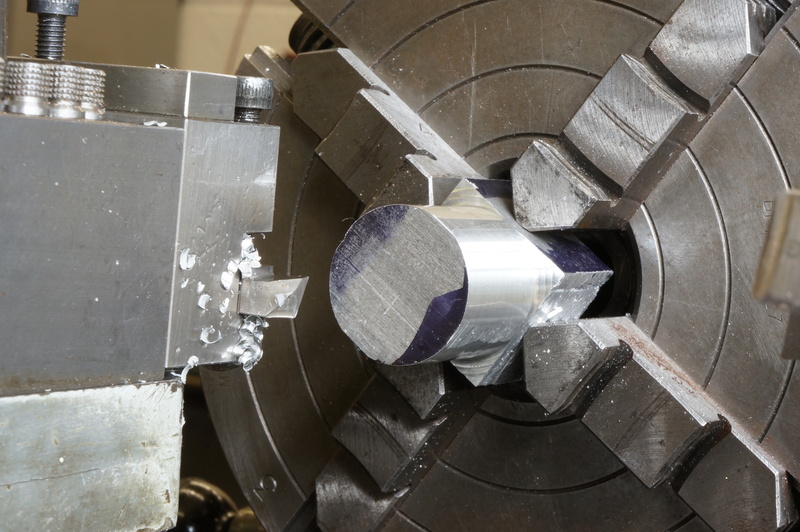 I set up one of the test pieces, centred it and drilled 4.5mm, to find the freshly ground drill is cutting about 0.006″ over size. I ground a boring tool and ran that through in the boring head to ensure the hole was true. First I tried my oldest reamer, which has spiral flutes and has been doctored and now cuts a bit smaller than I intended it to (No 1). Putting this through at 700 rpm with RTD lubricant gave a hole that was too small. I tried the new straight flute reamer, the one I used for a final shave on the con-rods, through the hole and this made the hole too big, as expected (No 3). The newest reamer also has a spiral, which I prefer. This fits in the hole more easily, so I will try that next (No 2). Ideally, the gudgeon pin wants to be a tight enough fit in the piston to not rotate even when the parts are hot. This may throw some light on the required fit. Heating the alloy to 100°C would, according to my calculation, expand the pin hole by 0.0004″. I tried a hole made with No 1 reamer only, again finished by hand. This allowed a 0.1877″ test pin to just enter, and when the piece is taken out of boiling water the 0.1881″ test pin will just, just enter the hole. But these little piston are not going to stay hot long enough to do even a frantic assembly, which would be the last thing to do anyway. Hot is not going to be the way. 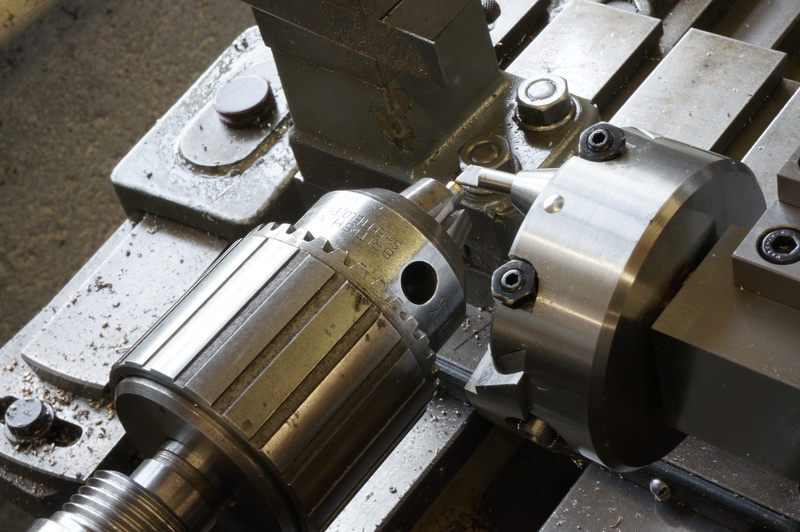 With a couple more trials, if found that using No 1 and 2 reamers in the lathe, at 350 rpm, pecking the cut 1⁄8″ at a time, then putting No 2 and 3 reamers through gently by hand, produced exactly the tight push fit I wanted. The first job today was boring the last of the pistons. The next job was slitting the piston milling jig to make a clamp. With the jig completed, I could set up for milling the internal bosses. The set up for this is a bit complicated. First, I clocked the central hole of the rotary table dead under the spindle and zeroed the table dials. Next, I clamped a piston in the jig, and adjusted the position of the jig to get the piston concentric with the rotary table. These settings are fixed for the rest of the job. 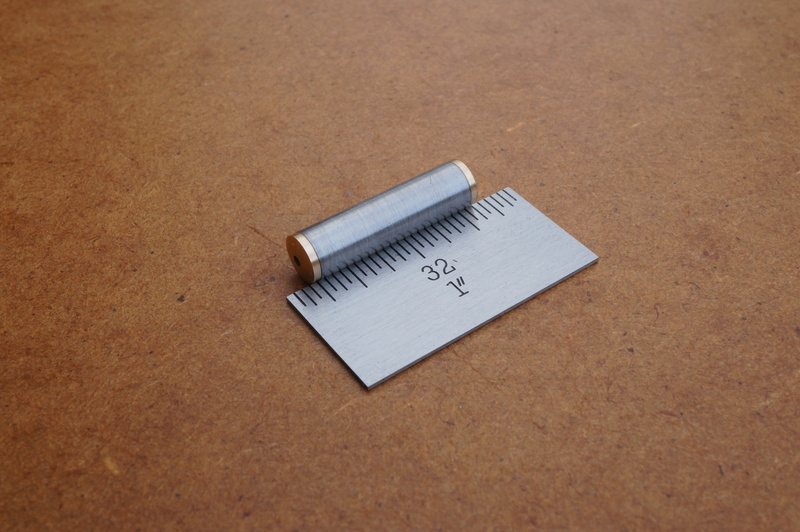 Finally, I used a 3⁄16″ ground rod in the gudgeon pin hole to set it parallel to the table. With the angle read off from the rotary table (in this instance it was 3.2° clockwise) the rotary table stops could be set for the nominal 38.8° swing each way (at 42° clockwise and 35.6° anticlock) required. The swing angle produces the correct boss geometry when used with a 1⁄8″ cutter, in this case a ball-nosed slot drill. A long-series one was needed to reach 9⁄16″ into the piston. 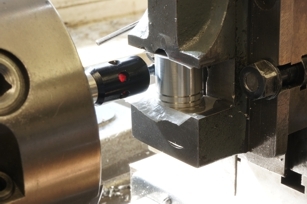 With the Y-axis on centre, the tool can be fed radially with the X-axis to put on the cut for each pass made by rotating the table between the stops. All being well, at a dial reading of 0.265″ the cut should coincide with the internal diameter of the skirt. This morning I milled the second piston. 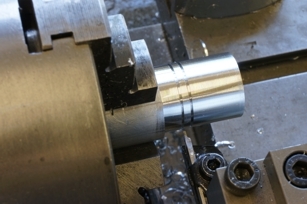 While setting up, I discovered that locking the milling machine's quill moves it a noticeable amount, so setting up needs to be done with the quill clamped or free according to the state it will be in when machining. For deburring this one I used an oak 'matchstick' to fold the burrs back and forth until they broke off. In the afternoon I milled the third one. This time I milled the arcs at top speed of 3750 rpm, but reverted to 2250 for the boss faces. The gudgeon pins are a tight enough fit in the pistons to be too hard to comfortably push in by hand. I sat the pistons in a v-block and pushed the well oiled pins in with a rod in the drilling machine chuck. I did a trial assembly with the crankshaft and cylinders in place, but no piston rings. Everything moves smoothly without detectable binding, but there was a little discolouration of the oil showing on top of No 2 piston, towards the flywheel. Turning the piston round shows the same pattern, so any misalignment is in the little end, not the piston. I don't think it will be a problem.